From a Capital Regiment press release: Adam Noaeill is returning to Capital Regiment for his second year on the podium. He is a graduate of Jenison High School in Michigan and attends Grand Valley State University in Allendale, Mich., where he is a music education major. His primary instrument is clarinet and he plans on being a band director. 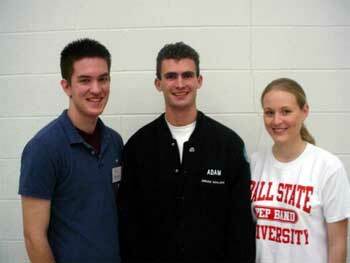 Left to right: Pat Murphy, Adam Noaeill and Megan Kuhnhenn. Megan Kuhnhenn is a first-year member of Capital Regiment and will be aging out this year. She is an elementary education major at Ball State University and plans to teach elementary or middle school math. She is a graduate of Lawrence Central High School in Indianapolis, where she was the drum major for three seasons. Pat Murphy is from Ridgewood, N.J., and graduated from Ridgewood High School. He is a trombone player and was the drum major of his high school marching band for two years. He attends Gettysburg College in Pennsylvania. This will be Pat's first year with Capital Regiment. Capital Regiment's program coordinator, Wayne Dillon, was very pleased with this year's drum major auditions. "We had seven excellent candidates who auditioned. It was a very strong group in terms musical skills and leadership potential. Adam, Megan, and Pat will be excellent on the podium and will provide exceptional leadership for the corps," Dillon said.